Abdoulaye Faye scored the only goal of the game for SenegalSenegal narrowly beat Algeria 1-0 in Dakar in Group 6 of the 2010 World Cup and Africa Cup of Nations on Saturday. 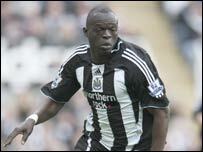 The only goal of the game came in the 80th minute from Abdoulaye Faye, who plays for Newcastle United in the English Premier League. The Algerian players claimed the ball had not crossed the line but television replays confirmed that the goal was legitimate. The other Group 6 game sees Liberia hosting Gambia on Sunday. I do not like the lineup. Hey Duport Road, is this your own selection, or is this the actual starting lineup. I know you have some direct connection. If this is the actual starting lineup, I am not too confortable with the SKs. I also think Koko is a midfielder and not a SK. However, the coaches are with the team and I think they know what they are doing. We should support the decision of the coaches. I guest Hey is trying to use a lot of young players to keep up with Gambia young team. Note, Duport you only name 17 players in this line up, you are suppose to dress 18 players. Who is the 18th player as sub?